None of us had ever flown in a helicopter before so it was with some trepidation that the five us boarded our 20-minute flight up the coast to the town of Saquarema. There are a lot of helicopters in Brazil. This is how the rich travel – no wonder, the roads take forever. Tourists were paying 100 bucks per person for a 5-minute flight around Rio from our Lagoa heliport. We had been invited to visit the Lagos Brewery – Luana Cloper and Gabriel Focini, the young Brazilian managers of the Mondial de la Biere – Rio festival: Jeannine Marois the President and Co-founder of the Montreal-based Mondial de la Biere; her right hand woman Marilou Caty; and myself, the journalist. It is customary to take a trip after the festival is over – to meet and greet brewers. Last year we visited Curitiba, an hour south by plane from Rio, and home of one of Brazil’s more famous breweries – Bodebrown. Owner Samuel Cavalcanti had invited us on his Beer Train tour, a riproaring adventure through the Atlantic jungle. This year, we coined the Ale-copter. The ‘copter was owned by a friend of Lagos founding partner Marcelle Lopes. We had been invited to a party on his family estate outside of Rio a couple of days before. I didn’t know much about Juan Paulo except that he was married to a former model, owned a regional football (soccer) team, and was a childhood friend of local bar entrepreneur Diego Rivera (Pub Escondido). The party featured typical Brazilian hospitality – a great spread of food and drink in beautiful surroundings, and a pretty hot Rio jazz and blues band for entertainment. After the pilot assured us his helicopter was safer than a plane, we strapped on the headsets and took off, out over Ipanema and Copacabana beaches, past Pau de Azucar (Sugar Loaf) and the opening to the Rio bay and up the coast. We landed in the stadium of JP’s soccer team. Lagos is a new brewery, purpose built to brew for gypsy brewers. It is a good concept. While in the US there has been a nationwide explosion of tasting room-focused small micro or nanobreweries, in Brazil brick and mortar is a more challenging concept, so most of the new generation of brewers are going the gypsy route. Perhaps “gypsy” is not the exact term that Lagos is looking for – more like contact brewing in the US, they want their clients to stay with them. Co-owner Marcelle Lopes and Brewer Rafael Torresini in front of Lagos’ 25-hecto brewhouse. The concept began when Marcelle’s father closed his steel business. He offered his large warehouse to his daughter: “What do you want to do with it?” he asked. 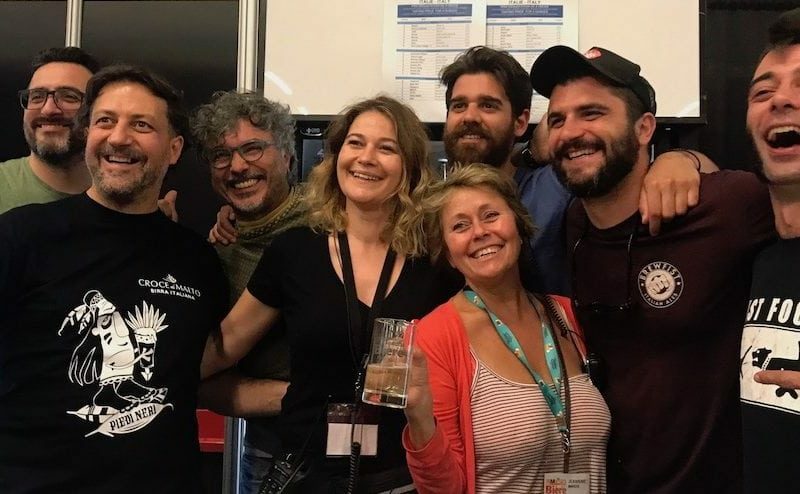 Her travel business wasn’t doing so great and she was well aware of Brazil’s exploding interest in craft beer – Marcelle and her husband Claudio decided they wanted to be part of that community. Their friend, Rafael Torresini, came on board, ditching his legal profession for brewing boots. Dennis Martins is the fourth partner. The four spent two years putting their business plan together and listening to suggestions from their brewing friends. Their big break came when Ilceu Dimer left established craft brewery Bodebrown. They hired him as a consultant and he took Rafael under his wing. They also hired a Brazilian company, Eguisa, to supply the equipment and do the brewery installation, soup to nuts, including 25-hecto brewhouse and 21 fermenting tanks of various sizes. Lagos, which means Lighthouse, has been open only since April, but they already have 20 clients, including established gypsy brewers like Hocus Pocus and 3 Cariocas, as well newer outfits like Rock Bird, Labirinto Gaspar Family Brewers, Marmota and Quatro Graus. Rafael at the Zwickel tap. We tasted several beers out of the tank by way of the Zwikel tap. “Whatever you want,” said Rafael. The sour Red Poppy and High on Milk, lactose NE IPA from Hocus Pocus; 3 Cariocas Sournilla (with passion fruit); Gaspar’s Doppelbock and Hoppy Bird from Rock Bird. Some were not quite ready, but everything tasted great. One thing Lagos is clear about – they don’t want their own brand. “We don’t want to compete with our clients,” Marcelle said, although they have brewed a couple of house beers for specific bar/restaurants. The old steel warehouse had a restaurant in a separate building on site. Marcelle keeps it open so they can feed their clients when they come to brew. They also rent a large house where brewers can stay. Brewing at Lagos is a 360-degree experience where they can share their camaraderie with their brewing partners.